With our profound expertise in this field, we are instrumental in offering our clients a wide range of Ferrous Ascorbete & Folic Acid Drops. We have provide you the best pharmaceutical medicines with wide range . 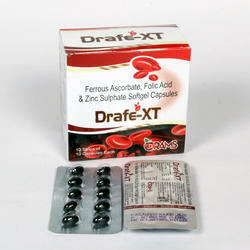 - Ferrous Ascorbate 100mg., Folic Acid 5mg.Zinc Sulphate 22.5mg. This medication is an iron supplement used to treat or prevent low blood levels of iron (e.g., for anemia or during pregnancy). Jaqson Health Care Pvt. 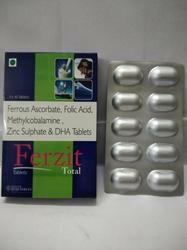 Ltd.
Folic Acid DHA VitB12mg, 250mg, 75mg, 15mcg. For the clients in medical sector, we offer Carbonyl Iron 100mg, Vit C 75mg + Folic acid+ Zinc sulphate monohydrate+Vit B12+ Vitamin E+ Selenium blended pellets in size 0. We have processed these in our advanced laboratory using only quality verified ingredients.